Cryoguard™ Corporation’s Thermal Exposure Indicators have been monitoring heat sensitive materials for over 30 years. The indicators eliminate failure due to thermal exposure of specimens in a variety of medical procedures including artificial insemination and in vitro fertilization. Cryoguard Thermal Exposure Indicators were originally developed to assure the quality of frozen blood products being administered on the battle field. They are now used to assure that the efficacy of sperm, eggs, bone grafts, vaccines, cord blood, blood plasma, stem cells, clinical specimens and premixed epoxy adhesives was not thermally compromised during shipping, storage and handling by technicians and customs inspectors. With a Cryoguard indicator monitoring your goods, you can tell in an instant (when the indicator is green) that the efficacy of your goods was not compromised by thermal exposure. Use of Cryoguard Thermal Exposure Indicators might have reduced the heart breaking loss of frozen eggs caused by depletion of liquid nitrogen coolant at the Ahuja Medical Center Fertility Center in Cleveland - had the center been using Cryoguard™ Thermal Exposure Indicators in freezer boxes to identify and salvage specimens that escaped potentially damaging thermal exposure. Additionally CryoguardThermal Exposure Indicators might have provided an early warning of liquid nitrogen depletion when the alarm system was turned off at the Ahuja Medical Center. Using the indicators eliminates costly and frustrating procedure failures caused by the use of thermally compromised products. At its signal temperature, a Cryoguard indicator irreversibly changes color from green to red within one to two hours. At 10°C to 15°C above its signal temperature the indicator changes color within minutes. At 25°C below its signal temperature the indicator remains green. Cryoguard indicators are available with “signal” temperatures preset at -40°C, ‑70°C, ‑100°C, -120°C, -135°C and -150°C. Each batch of indicators is tested to ensure they function as specified under the product description. By monitoring your goods with an indicator whose signal temperature is: a) equal to or lower than the maximum temperature designated for your goods and b) at least 25°C higher than the temperature used for shipping or storage, the indicator while green provides assurance that your goods are safe to use. For example, the M-150 indicator is used to monitor products shipped or stored in liquid nitrogen that need to be kept at or below -150°C, whereas the M-40 indicator is used to monitor products shipped in dry ice that need to kept at or below -40°C. Cryoguard indicators eliminate the guesswork in deciding whether heat sensitive products are safe to use and in so doing provide a hassle free alternative to a data logger. Cryoguard Corporation also provides Cryoguard freezer boxes. These boxes have openings on their sides for viewing indicators to facilitate verification that the material in the freezer box was never subjected to potentially damaging thermal exposure during handling, power failures and periods of coolant depletion. The temperature in a liquid nitrogen storage tank can vary from about -130°C at the top to -190°C at the bottom. If the liquid nitrogen level is not properly maintained, specimens near the top of the tank may rise well above -130°C. Moreover, when multiple specimens are stored in a freezer box or on freezer cane or rack, removal of each specimen transiently exposes the remaining specimens to a near ambient temperature. 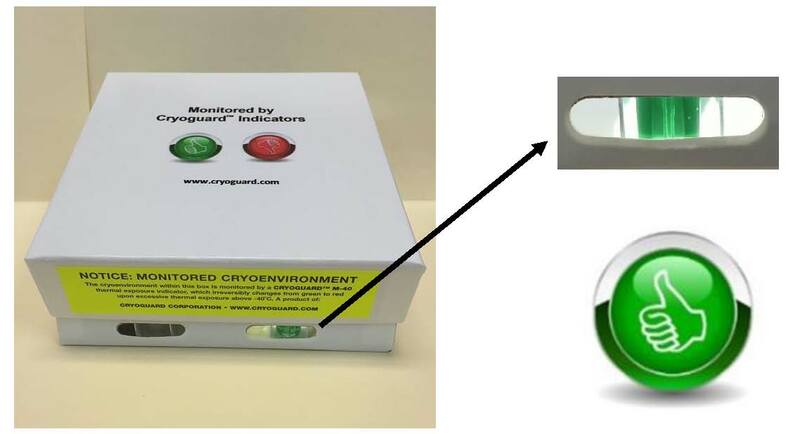 Using a Cryoguard Thermal Exposure Indicator in each freezer box and on each freezer cane or rack ensures when the indicator is green that the efficacy of your stored specimens were never thermally compromised by nitrogen depletion or repeated transient exposures to a near ambient temperature. With a Cryoguard indicator monitoring your goods, you can tell in an instant (when the indicator is green) that the efficacy of your goods was not compromised by thermal exposure during storage and handling. Cryoguard Thermal Exposure Indicators provide assurance to you and your customers that your products were never thermally compromised. Join the leading hospitals, fertility clinics, stem cell labs, universities and aerospace companies who rely on Cryoguard indicators to ensure proper handling of heat-sensitive materials. Try a Cryoguard Indicator today! Check us out on Facebook , LinkedIn , and Twitter by clicking on the icons! Get the latest information about our company and products. We deeply appreciate any feedback that you can give us regarding your experience with the indicators and how we might improve the indicators to better meet your needs. Please place your feedback in the customer comment box when you place an order or send your feedback to becky@cryoguard.com.